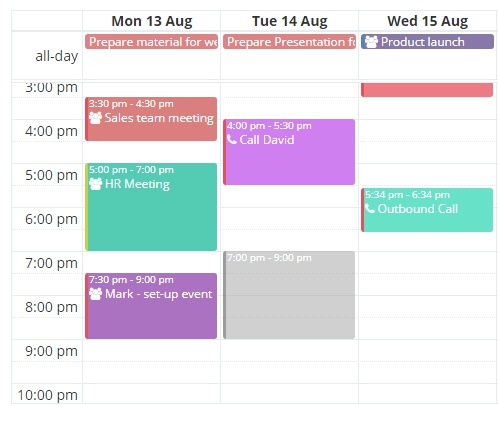 Organizing a joint event or checking the schedule of any employee is very easy, thanks to the capabilities of the calendars Flowlu. 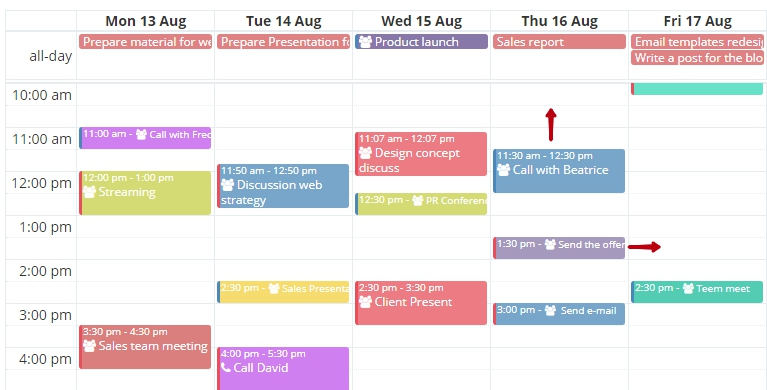 Before scheduling an event, check or uncheck the checkboxes next to the calendars for which you want to see the scheduled events. Then switch to a convenient mode of viewing the calendar: daily, weekly, or monthly. Use the switch if you need to know the schedule for the next week or month. When you have determined the date and time, click on the time interval and select the area according to the duration of the event. 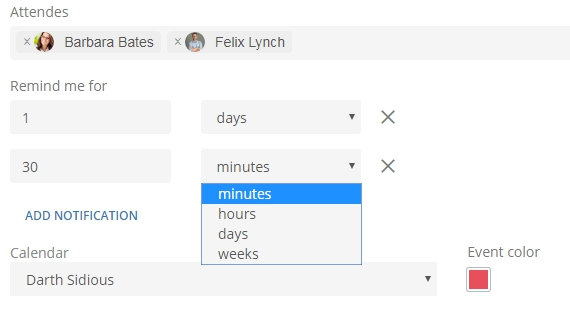 After that, the window with an assigned date and time will be created. Enter the name, change the date or time if necessary, or set the checkbox in the column "All day". Use additional features, such as inviting participants, adding the event reminders, additional privacy settings and so on. 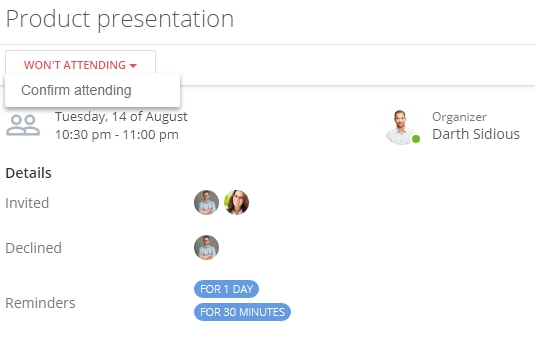 To participate together in an event (meeting, presentation, or conference), you can invite any portal user. After saving the event, the colleagues will receive a notification and will be able to confirm or decline attendance. Tips and Tricks. 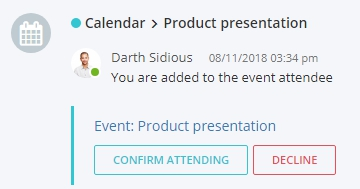 After the user confirms participation, this event will be displayed on his personal calendar or in the invitations’ calendar, depending on the settings. All the event details will also be available to him. For each event, you can schedule several reminders at once for a certain number of minutes, hours, days, or weeks. If this is a joint event, then all accepted the invitation participants will receive notification at the specified time. Before saving an event, select the calendar in which you need to display this event. Then, if desired, specify the event color. 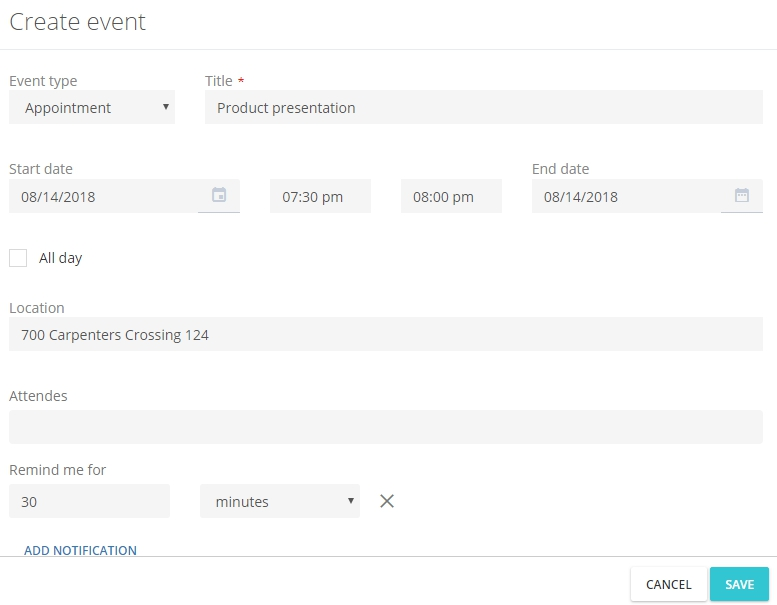 When creating an event, you have an option to change the status to Available, if the scheduled event does not imply your absence. It can be sending an e-mail, preparing for a conference and so on. Select the Busy status, if at this time you will be absent from the office, be at the client meeting or at the conference. This is necessary for colleagues with the "Viewing availability" access level to your calendar since they can not access the event name, but only the status. You can also further restrict or open access to viewing event information for colleagues. If you create a personal event, then only those users who have access level to this calendar not lower the editing one will be able to see it. If you create a public event, then its details will be visible to all users who have access to this calendar, regardless of the level of access. After the event is created you can quickly change the date and duration in the calendar using the Drag & Drop method. Open the event and click on the pencil (1) to change the details or to the button with 3 dots (2) to delete.